Expectations were very high for Russia’s team at this tournament. Not only was there extra pressure in the wake of the senior national team’s successes, but also these World Juniors were held on home soil in Ufa. New coach Mikhail Varnakov brought back nine players from the silver-medal 2012 squad, including captain Nail Yakupov, forwards Mikhail Grigorenko, Nikita Kucherov, Alexander Khokhlachev, and Yaroslav Kosov, defensive leaders Nikita Nesterov and Albert Yarullin, and the goaltending tandem of Andrei Vasilevski and Andrei Makarov. This year’s team did not dominate opponents like in 2011 or 2012. Russia was outshot in all but one game and all of its victory were only by one goal, other than a 7-0 routing of Germany. 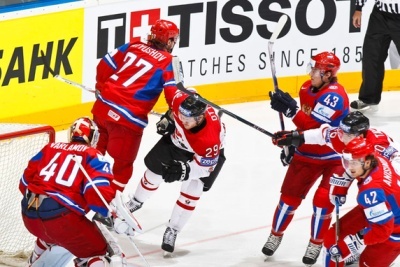 A 4-1 loss to Canada in a highly anticipated match on New Year’s Eve meant that Russia finished second in its round-robin group and faced the Swiss team in the quarterfinal. Russia was on the verge of a catastrophic finish to the tournament, losing 3-2 to Switzerland, before Kucherov tied the game 3-3 in the dying minutes of the third period. Russia then won the shootout tie-breaker. 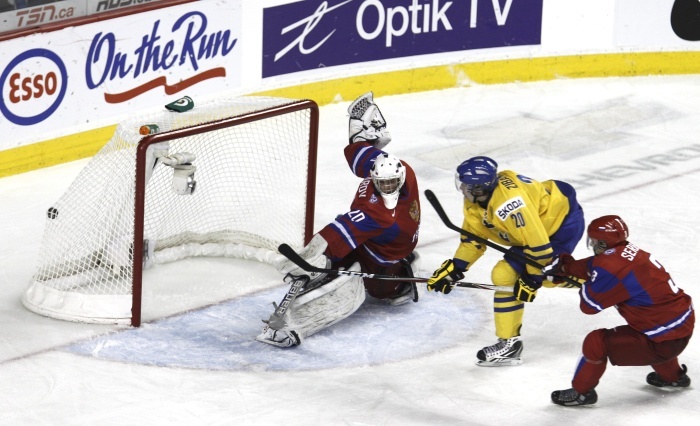 The semifinal against Sweden also went to a shootout, with Russia losing this time. Russia usually saves its best hockey for elimination games against Canada and this year was no exception. Although the stakes were bronze medals rather than gold, both teams were offensively charged and were unwilling to let the other team dominate. After opening with a 3-1 lead, Russian penalties allowed Canada to catch up. Every subsequent Russian goal was answered by Canada’s attacks. After a 5-5 finish in regulation, the game was sealed early in the second minute of overtime as 17-year old Valeri Nichushkin rushed from Russia’s end to Canada’s and buried the puck in the net to earn Russia a third-place finish. With either of Canada or Russia failing to advance to the final, and with Canada’s 15-year medal streak coming to an end, this tournament has indicated that there are no longer just two favourites at the World Juniors. Goalie Makarov catches the puck as Dyakov and Nesterov defend against the U.S.
No matter how talented a roster Russia gathers for every World Championship, there are always concerns about team chemistry, defense, and discipline. From 2007 to 2011 under coach Slava Bykov, Russia won two gold medals, one silver, and one bronze. 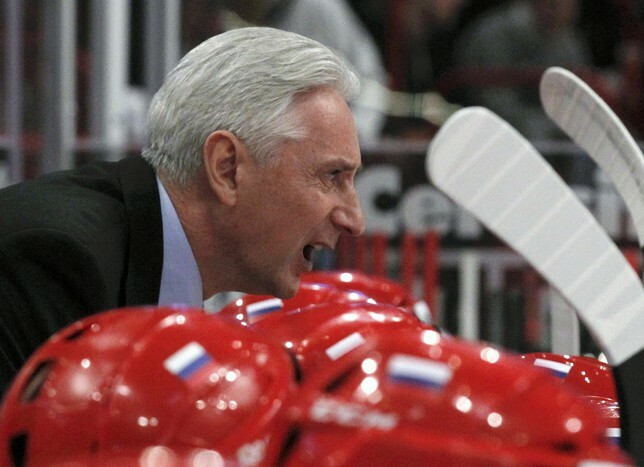 However, Russia’s 4th place finish in 2011 was an obvious disappointment and led the Russian Hockey Federation to replace Bykov with accomplished Ak Bars Kazan coach Zinetula Bilyaletdinov. The new coach brought back only seven players from the 2011 team and invited ten debutants, including Traktor star Evgeni Kuznetsov, Ak Bars defenseman Evgeni Medvedev, and Omsk winger Alexander Popov. The team was captained by veteran defenseman Ilya Nikulin and led offensively by NHL stars Evgeni Malkin and Pavel Datsyuk. Colorado Avalanche goalie Semyon Varlamov was tasked with the bulk of the goaltending duties and was backed by Konstantin Barulin. Russia won all of its round-robin games, including a 7-3 comeback win over Sweden after trailing 3-0. Malkin had instant chemistry with wingers Popov and Perezhogin, with the trio combining for 19 goals and 40 points. Russia’s only black mark was the suspension of defensemen Emelin and Kalinin for unsportsmanlike play in the game against Czech Republic. However, the team was strengthened by the arrival of Alexanders Ovechkin and Semin for the playoff round. The duo was centred by Datsyuk and even outshined Malkin’s line in the elimination games. Since the 1980s, Russia has never so easily and confidently cruised to a gold medal victory. The usually pesky and difficult Finns were no match for Russia in the semifinal, even on their home ice in Helsinki! Russia faced the spirited Slovaks in the final. The Slovak captain Zdeno Chara opened the scoring, but then all four of Russia’s lines contributed for a 6-2 routing. Although Malkin with his 11-goal performance won the tournament MVP award and both him and Nikulin were named to the tournament all-star team, none of Bilyaletdinov’s selections looked out of place at this tournament. The team was greeted with euphoria as they brought Russia’s third World Championship trophy in five years to Moscow. One year after winning the gold medal in an exhilarating comeback against Canada, Russia came to these world juniors with almost an entirely new roster, with team captain Evgeni Kuznetsov being the only returning player. Coach Valeri Bragin included a record six players from the Canadian junior leagues on the team, including the potential no. 1 NHL draft pick Nail Yakupov. Russia began the tournament on a confident note, giving up only one goal in its first three games and destroying Latvia 14-0. In this game, Kuznetsov came one point short of tying Peter Forsberg’s record for the most points (ten) in a single world junior championship game. Leading Sweden 3-0 in its following game, Russia collapsed in the third period and lost 4-3 in overtime, forcing the team to play a quarterfinal match against the Czechs. The quarterfinal featured the best goaltending battle of the tournament with 17-year old Andrei Vasilevski and Czech goalie Petr Mrazek both putting on world-class performances. After eliminating the Czechs in a tight victory, Russia had to face a relaxed Canada in the semifinal the next day. Russia’s fatigue didn’t factor until the third period, as the team took a commanding 6-1 lead with only 12 minutes left to play and garbage being thrown on the ice by the disappointed Canadian fans. That was when Canada launched one of the most amazing comeback attempts in the history of Russia-Canada confrontations. The team in red scored four goals in the span of five minutes, forcing the excellent Vasilevski to be replaced in net by Andrei Makarov. Canada worked until the final second to try tie the game, but Russia held on to win 6-5. Given that Russia was outshot by more than a 2-1 margin, it is fair to say that goaltending once again saved the team. Facing Sweden for the gold medal, Russia clearly had not physically or mentally recovered from the semifinal. It took the Russian offense 13 minutes to register a single shot on goal. Sweden had nearly total puck control and fired a whopping 58 shots on Makarov, but the scoreless game did not truly open up until the final ten minutes, when both teams launched one dangerous attack after another. Sweden dominated the overtime period and deservedly won the game after a Russian turnover enabled Mika Zibanejad to face Makarov one-on-one and score the game’s only goal. 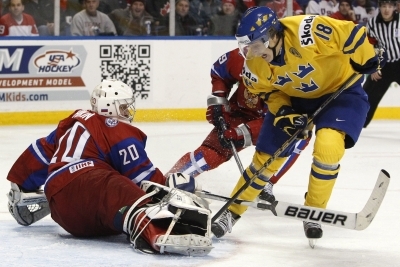 Sweden’s win was its first world junior gold medal in 31 years. It was unfortunate that Russia did not find its usual up-tempo game, but given that most of its players were just 17 and 18 years old, they will have another chance to fight for gold next year on home ice. After the game, Kuznetsov was named the tournament MVP, best forward, and member of the media all-star team. This tournament brought Russia’s four-year medal streak at the World Hockey Championships to an end. Russia entered the tournament with a weaker group of players than in 2010, but still brought plenty of familiar faces, with only two players (Vladimir Tarasenko and Nikolai Belov) making their WC debut. 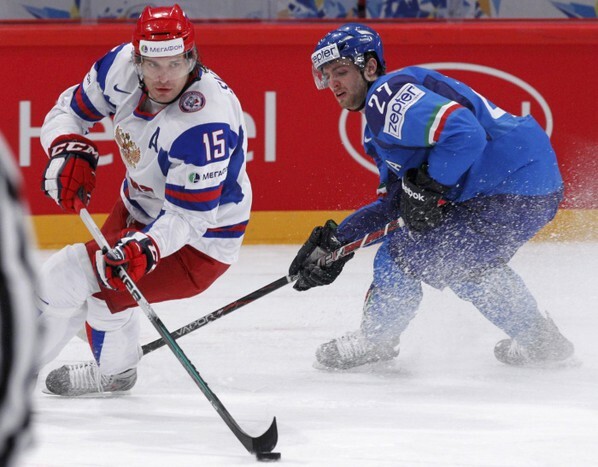 Plenty of weaknesses became apparent as Russia struggled right from the opening game, getting shut-out by Germany, and in subsequent tight victories against lesser hockey powers like Slovenia and Denmark. The coaching staff entrusted Evgeni Nabokov to be the starting goaltender. Having sat out most of the season, Nabokov was not in ideal shape and suffered a leg injury in the fourth game, forcing Konstantin Barulin of KHL’s Atlant to handle the remaining games. Russia was also set back by an underwhelming group of centres, a struggling powerplay, undisciplined play from Alexei Emelin and Evgeni Artyukhin, and a faulty defense. Alexander Ovechkin was parachuted in to boost the offense, but he did not register a single point. After losing its remaining round-robin games to the Czech Republic and Finland, Russia faced off against the young and talented Canadian team in the quarterfinals. As usual, this matchup provided for the most entertaining hockey of the tournament, with Canada leading 1-0 midway through the third period. Alexei Kaigorodov then deked through the Canadian defence and scored a beautiful shorthanded goal to tie the game. A few minutes later, Ilya Kovalchuk sniped in the game-winner from Alexander Radulov’s pass. This tandem was Russia’s main highlight in the tournament. By defeating Canada in the quarters for the second straight year, Russia did not have enough energy and willpower to maintain such tempo for the rest of the tournament and went on to lose in the semifinal to Finland and in the bronze-medal game to the Czechs (this turn of events resembled the 2006 Olympics for Russia). What is especially concerning is that Russia lost five games out of nine. While Vyacheslav Bykov’s record as Russia’s coach is still an impressive 40 wins to 9 losses, a fourth place finish is clearly a disappointment. With its first world junior championship gold in eight years Russia achieved not only the greatest comeback in the tournament’s history, but also gave one of the greatest demonstrations of willpower and determination in Russian hockey history. The road to beating Canada 5-3 at the Canadian-filled HSBC Arena in Buffalo was anything but smooth. Coach Valeri Bragin’s roster was not among the most talented Russian world junior squads in recent years and the team struggled out of the gate, losing to Canada and Sweden in the first two games. 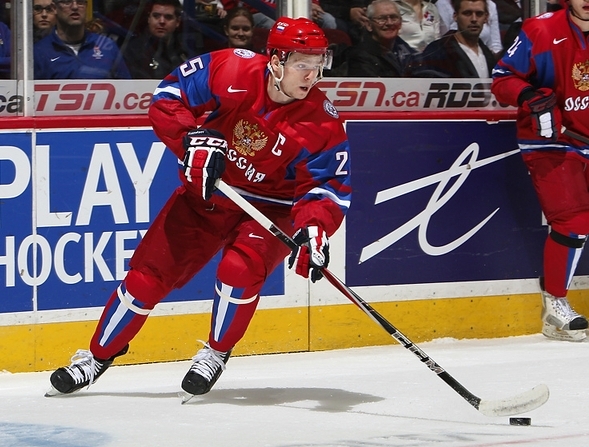 Thanks to the chemistry on Evgeni Kuznetsov’s and Vladimir Tarasenko’s lines, Russia dominated its next two opponents. The medal round was written like a dramatic fairy tale for Russia. In both the quarterfinal against the Finns and the semifinal against the Swedes, Russia was less than two minutes away from losing before tying the game and ultimately winning it in overtime (against Finland) or shootout (against Sweden). The amount of emotion that these comebacks gave to the players transpired into an especially passionate gold-medal final against a confident and heavily-supported Canadian team. The canucks gave it their all in the game’s first two periods, scoring three straight goals on Russia and causing Bragin to pull goalie Dmitri Shikin in favour of Igor Bobkov, who let in six goals in Russia’s first game against Canada. The decision paid off, as this time Bobkov was a wall in net. Early into the third period, Russia scored a pair of goals thirteen seconds apart, completely changing the dynamic of the game. 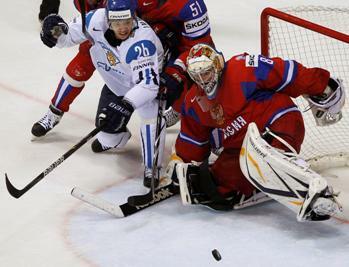 Russia did not stop its speedy assault and gunned three more goals to silence the arena and seal the game’s fate. 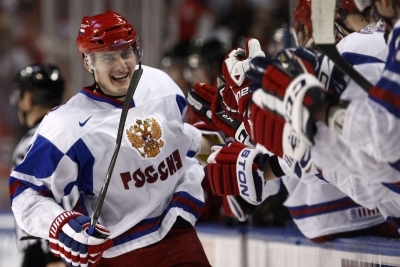 Defenseman Dmitry Orlov and forward Kuznetsov made the tournament’s all-star team, while Bobkov was named Russia’s MVP. In one of the most exciting world junior final games in years, Canada met arguably Russia’s strongest team ever at the juniors. Despite being behind 2-1 through two periods and with the entire crowd against them, Russia pulled off a sweet victory. It was the rematch of the 2002 final and there was no revenge for Canada. This was the third time in five years that Russia beat Canada for the gold, the previous times being in 1999 (also on Canadian soil) and in 2002 in Czech Republic. When the game started Russia immediately began to dominate the play. Canadian goalie Marc-Andre Fleury made a few spectacular saves to help his team, but was beaten by Andrei Taratukhin. Canada quickly tied the game less than a minute later. The exciting first period was followed by a relatively dull second period. Both teams looked tired at times, but Canada scored and took the lead. Early into the third period, Igor Grigorenko scored on Fleury to tie the game. A couple of minutes later, Yuri Trubachev put the puck high into the net. During the remaining ten minutes of the game both teams had quality opportunities to score, but Russia’s defense held the fort to the end. At the final buzzer, the whole team mobbed goalie Andrei Medvedev, who made 22 saves. This was Russia’s fifteenth gold medal at the juniors (including Soviet Union’s gold medals). Following the game, Grigorenko was named the tournament’s best forward. When Grigorenko received his award he skated to Medvedev and shouted to the crowd in Russian “The best – is him!” The key to victory was a mix of four stable forward lines, a strong defensive game, and Medvedev’s size and agility. Coach Rafail Ishmatov trained the players to be as disciplined as they can be against the Canadians. 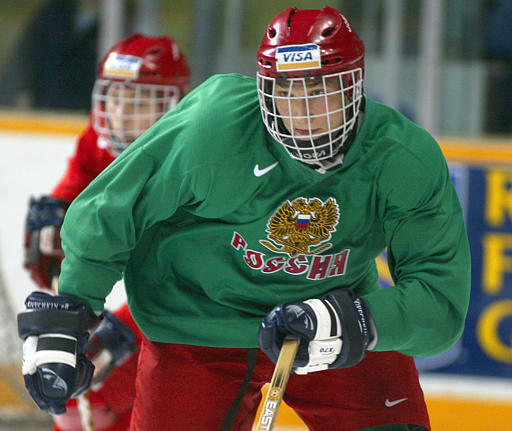 Nine members of this Russian team, including superstar Alexander Ovechkin (who had two hat-tricks at this tournament), have since made it to the NHL and many others became stars in the Russian league. In the aftermath of the Winter Olympics, the IIHF World Championship predictably attracted significantly less elite players than usual. Russia was the only major national team to not have a single invited player refuse to participate. A whole set of players was unable to play due to injury, but most of Russia’s Olympians returned, making Russia the automatic favourite to win the championship for a third straight time. Former NHL enforcer Andrei Nazarov joined Vyacheslav Bykov and Igor Zakharkin on the coaching team. Despite the ultra-talented roster and strong team atmosphere, Russia did not dominate their opponents as expected, saving their limited energy. With Evgeni Nabokov and Ilya Bryzgalov each safeguarding Russia’s net all the way to the gold medal in 2008 and 2009, this year it was 22-year old Semyon Varlamov’s turn. Room was also made for other younger players like Nikolai Kulemin, Dmitry Kulikov, and Artem Anisimov, all of whom are likely to be part of the 2014 Olympic team. The additions of Evgeni Malkin and Pavel Datsyuk (both of whom were busy in the Stanley Cup finals the previous two years) to captain Ilya Kovalchuk’s line led to some of the greatest chemistry and wizardry seen in the national team’s recent history. 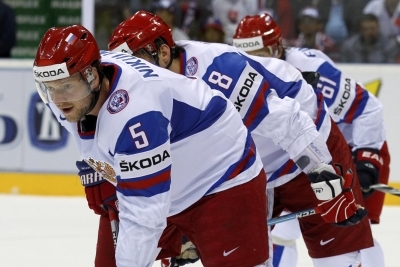 Russia’s best efforts came against the two most physical teams – Finland and Canada. While beating an outmatched Canadian team was no consolation for the quarterfinal loss in Vancouver, the victory meant that Russia sent Canada home for the third straight year at the WC. After barely eliminating Germany in the semifinal by a late but brilliant Datsyuk goal, Russia entered the gold medal final as a tired team that was continually frustrated by the Czechs from the very first shift (in which the Czechs opened scoring). A goal by Datsyuk was waived off as it came after time ran out in the first period. Russia’s discpline problems, including Alexei Emelin’s match-penalty hit on Jaromir Jagr, were untimely, as was the team’s inability to solve goaltender Tomas Vokoun. The team never gave up and in the tense last minute of the game, Datsyuk (who else?) one-timed Kovalchuk’s pass into the Czech net. It was too little and too late to save the game. Veterans Jagr and Sergei Fedorov, as well as Anisimov, were all injured in the match. The Czechs won their first gold since 2005, while Russia settled for its first silver since 2002. Datsyuk was named the tournament’s best forward and Malkin joined him on the media all-star team.